Could Earth’s Magnetic Poles Flip This Century? Above are supercomputer models of Earth's magnetic field. On the left is a normal dipolar magnetic field. 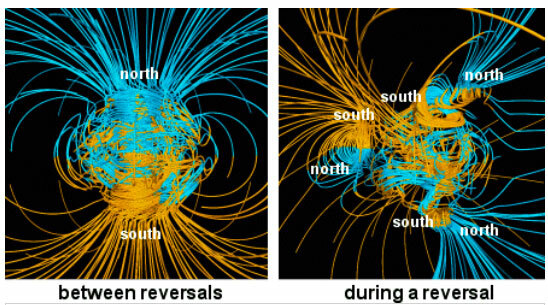 On the right is the sort of complicated magnetic field Earth would have leading up to a pole reversal. The Earth's dipole magnetic field, akin to a bar magnet, remains about the same intensity for thousands to millions of years. Then for unknown reasons, it can weaken and reverse polarity. In the first half of 2014, data indicates that the Earth's magnetic field is decreasing 10 times faster than normal. Illustration by NASA. December 18, 2014 Berkeley, California - 786,000 years ago, iron atoms in Earth's liquid outer core began switching their orientation in opposition to the existing Earth magnetic field. What causes iron atoms to act like tiny magnets that revolt against the planetary magnetic field is not understood. But when it happens in increasing numbers, patches of reverse-aligned iron atoms keep growing until they dominate the rest of the Earth's liquid outer core — and the planet's magnetic field flips. That means what was the north magnetic pole becomes the south magnetic pole and what was the south becomes the north. According to ancient sedimentary rock, volcanic ash and sea floor core research, there have been 184 polarity changes in the last 83 million years. 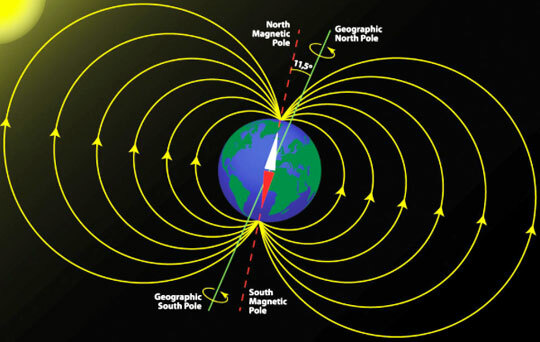 Recent ground research indicates that in the century before the last pole flip, the Earth's magnetic field weakened and strengthened and weakened and strengthened several times before locking into the current north and south magnetic poles.